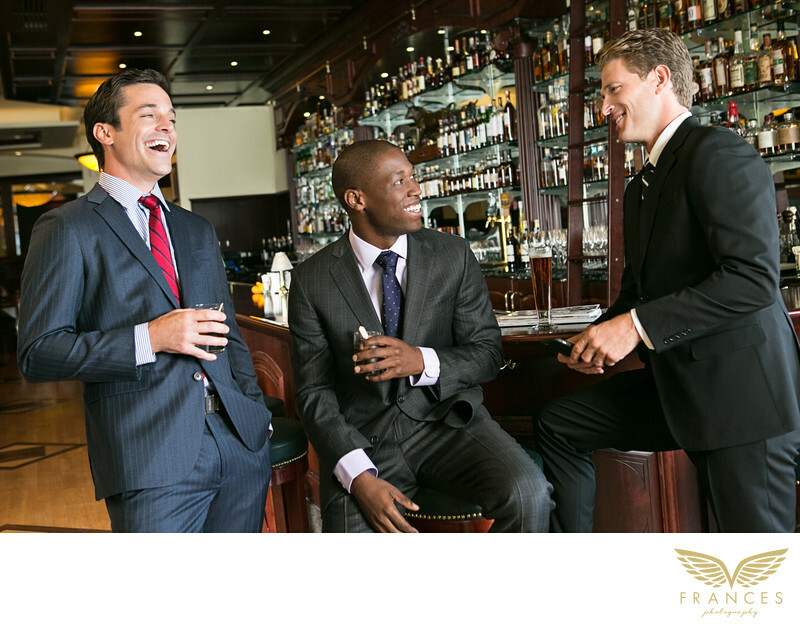 Three male models in classic suits are laughing animatedly while grabbing drinks at a bar. They are likely modeling for a men’s clothing brand, posing as colleagues at their local bar for post-work happy hour drinks. The man on the far left is wearing a dark gray suit and a red tie, while the other two are in classic black suits with white shirts underneath. With carefree smiles on their faces and drinks in their hands, they look like they’re having a great time just chatting and hanging out. The wooden décor, rows of liquor bottles, the pint of dark beer and their well-tailored suits all exude a more masculine environment. The men appear to be wealthy and successful bachelors in the big city, working in finance or law, and have ties to established names and families. They are young, good-looking, and ooze that kind of confidence that stems from a privileged upbringing and background.